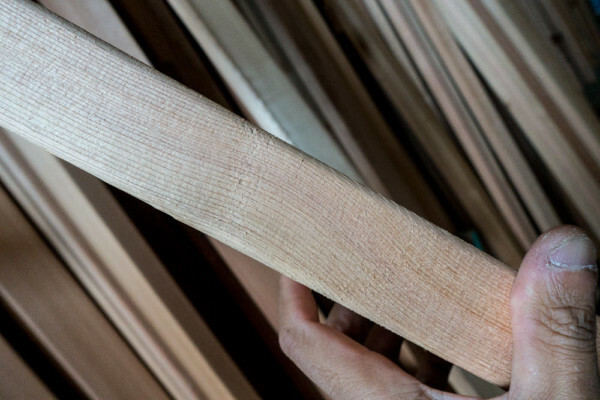 Choosing the right wood for your kayak or paddle is the single most important factor of the durability of your boat. Kiliii explains the mysteries of wood grain and what to watch out for. Hi folks, this is Kiliii Yuyan from Seawolf Kayak. 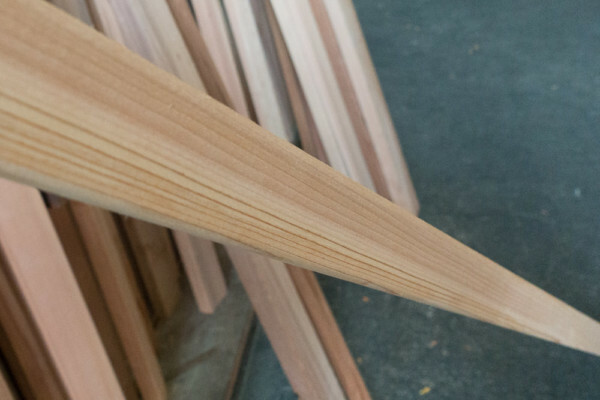 Let’s talk today about choosing the right kind of wood to make a good Greenland paddle, or for the frame of a skin-on-frame kayak. We’re going to look at two pieces of wood. These are two pieces of cedar. One is darker and the other is lighter. 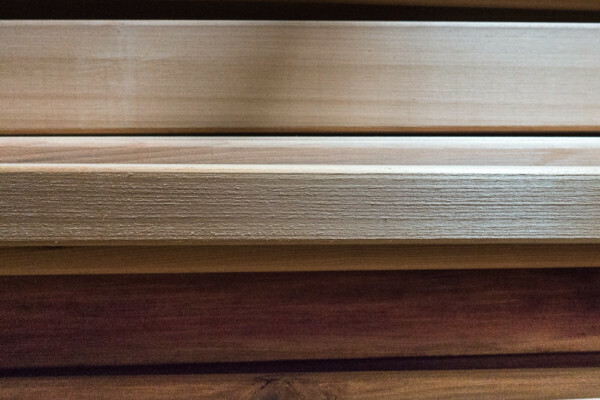 The darker one is cedar heartwood, which is marginally weaker than the sapwood. 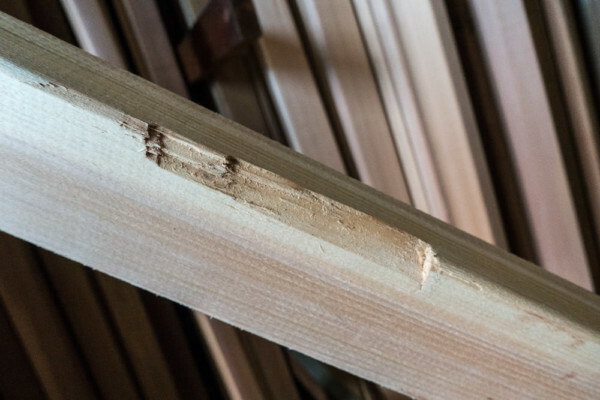 Let’s look at pieces of wood and their grain. When you look at this piece you can see the grain along the edge is nice and straight. but over a long distance the grain falls off the edge. You want grain to stay parallel from one side of the board to the other. Some of the flaws you can have include crushed areas. Forklifts and straps can crush the wood, and that area will ruin the entire section that runs up and down the wood. You also want to avoid knots. Bigger knots are obvious but also the little tiny pin knots, pictured left, you can get away with them if that’s all you can get but otherwise avoid them. Sometimes there is curved grain, where the grain swoops in a curve. A minor curve that bends back is ok, but generally you want to avoid the steep curves where the grain becomes short and weak. 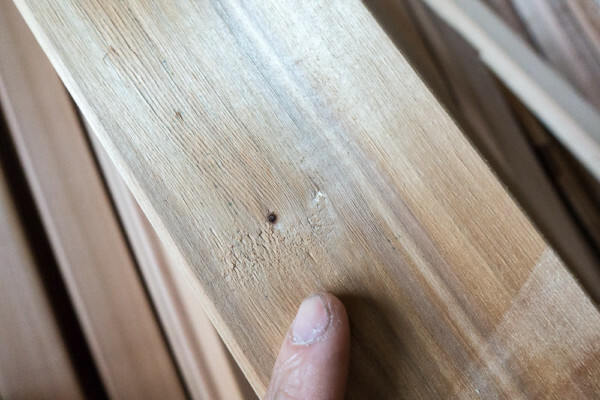 Let’s look at nice grain — straight and parallel along the entire length of the wood.